Happy Fourth of July!! This is one of my favorite holidays of the year, and as a result, there is always a lot of pressure to have the perfect outfit. Every year I go up to my grandparent's lake house, so my outfits are always very casual. Usually, I'm wearing a tee or tank with some chino shorts(check out what I wore last year here). Though how fun would that blue dress be if you are going to something a little bit nicer. I thought I would write this post to give you all some inspiration for what to wear today. But even if you already have a Fourth of July outfit picked out or you find this post later on; remember that red, white, and blue is a classic all summer long! 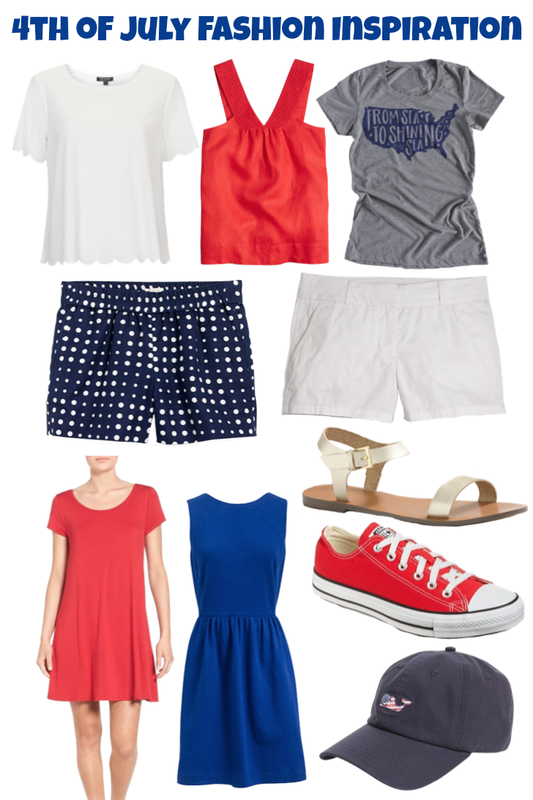 J.Crew Factory was my go-to place to find Fourth of July inspiration. They had red, white, and blue in abundance on their site! I love the red top paired with white shorts and classic sandals. If you want to add even more American spirit you can sport the super fun Vineyard Vines baseball cap. If you want to keep it a little bit more simple, I love the navy blue polka dot shorts with just a crisp white top. It is classic, but still shows some Fourth of July spirit. If you are playing it more casual like me I absolutely love this tee I found on Etsy and you can't go wrong with some converse, how cute are these red ones! And if you want to dress up a little bit more the red t-shirt dress or blue cotton dress are obviously perfect choices paired perfectly with some simple sandals. So many cute things, I want to buy them all! To see what I am wearing check out my Instagram @welldressedash (the title is a little hint)! I hope you all have a great day and enjoy spending time with your friends and family celebrating the wonderful country we live in. Light a sparkler, eat a popsicle, and watch some fireworks!